Description: Spacious and beautifully updated home in sought-after neighborhood. Features open floor plan and 4 beds. on 2nd floor. Updates incl. new EIK with granite counters and ss appliances, updated baths, - elegant Living Room overlooking the quiet, tree-lined street, Formal Dining Room which opens to top level of beautiful two-tiered deck, spacious Family Room which opens to bottom level of deck, ground floor laundry and finished basement with recreation room, office and plenty of storage. Additional features incl. 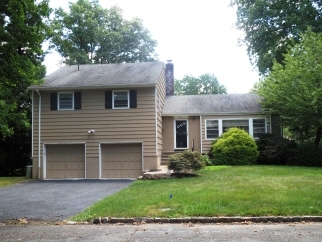 Master Bedroom with newer, en-suite bath, newly refinished hardwood floors throughout, central air. Quiet street just a block from Unami Park, yet is close to all schools, beautiful downtown Westfield and the train. SELLER WILL GIVE CREDIT FOR SIDING.